Rishtan is a city in Fergana Valley of Uzbekistan. 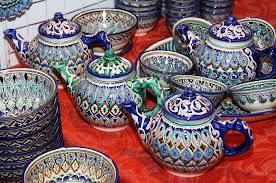 It is known for its pottery and ceramic products. Rishtan ceramics has its unique features. Secrets of making dishes are passed on father to son. A man participates in the basic technological processes of production, as it is very difficult to manufacture such kind of dishes. Women are respectively are engaged with painting and decoration. Masters of Rishtan mainly use floral patterns, so the geometric pattern in their work has never played a major role. Rishtan ceramic is very varied and picturesque, has the ability to play sound of high quality porcelain. It is believed, if the sound is louder, the quality of dishes is better. There are three main things in the manufacture of tableware: a special form of patterns, a certain color of paint and unique glaze. This glaze is called ishkor so Rishtan ceramics are sometimes called ishkor. Rishtan tableware is known not only for its beautiful scenic designs as well as it promotes healthy digestion and serves as the mascot for its owners. Drawings and decorative patterns give a magical sense. For example, garnet is a symbol of health and longevity, almond – good luck and happiness. It is also believed that the dishes have the positive aura, as a potter transmit power and energy in the process of making, singing and reading the prayers. Consequently, the use of such utensils gives positive effect on human health, protecting him from all harm. Besides the fact that it is very pleasant to eat from such cookware, Rishtan ceramics is always meant for gifts and decorating the home. 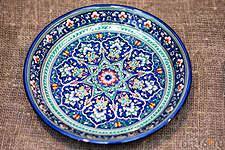 Having arrived in Uzbekistan, you can always buy one of these beautiful dishes. It will not only beautify your home but serve as a talisman. Seeing these unusually beautiful patterns, you will plunge into the world of the East.